If this is you, then you’re the reason I wrote this post. There are a whooping ten of million blogs worldwide. And 60 millions of them powered by WordPress alone, yet most bloggers didn’t monetize their blog. Whether you want to make an extra from your hobby or build an online business, a good place to start is with affiliate marketing. 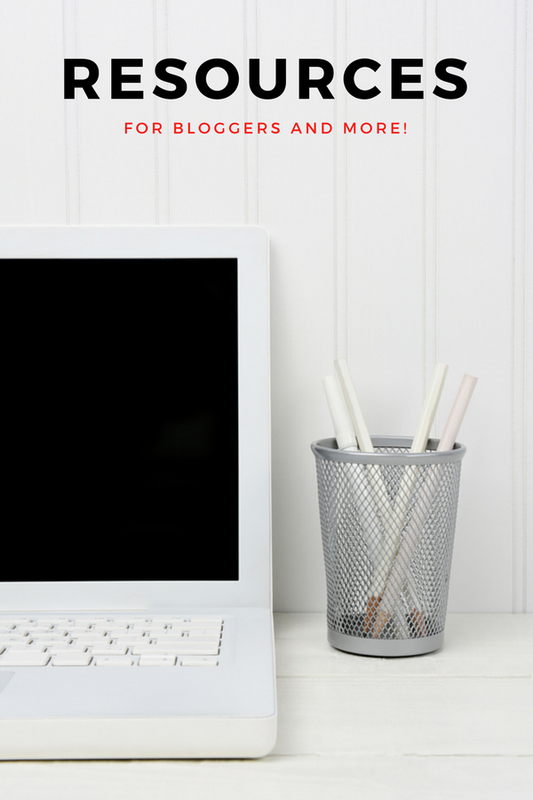 In this post, I’d like to share everything I know about affiliate marketing as a blogger. My name is Anh, I’m a rookie and avid affiliate marketer. And yes, I do make money online, here’s me sharing my first sale. … or making up to 5 figures in a year. Affiliate marketing is a way to make money online by recommending products or services to others. These folks can be anyone from your friends or people you’ve never met, as long as they make a purchase through your link. Chances are you’ve heard about huge affiliate marketers’ successes like Pat Flynn who makes up to 100k per month online. To add even more perspective, in 2011, ValueClick reported their affiliate marketers’ revenue to be over $84,573k. The potential in this business is huge. Organically, folks who are already willing to buy will come to find you. You’ll need to master a bunch of skills to successfully nail this whole process. Below we’ll start with the fundamentals and tips to set you on the right foot to earning your first sale. Basically, the product owner will give you a unique special link that allows them to track whenever some bough from that link. The most common and basic type of tracking is via cookies. When the link is clicked, a small file called a cookie is stored on their computer letting the merchant know that if a sale is made, it came from you. Well, you can promote anything. The majority of products that you can buy online have an affiliate program attached to them. The question here is really not about how to find them, but which one should you choose. Start with 2 – 3 affiliate products first, or join a big retailer like Amazon. You don’t want to be overwhelmed. And most importantly, only recommend products that you would to a friend. Affiliate marketing is a way for you to earn a commission for recommending products or services to others. The best approach to affiliate marketing is to create a WordPress blog that gives honest reviews on affiliated products from programs like Amazon, with your tracking links. It’s best (but not necessary) to go with products you have experiences with. Now that you know what affiliate marketing is all about and how to choose the best products to promote, here are ultimate tips compiled from my experience as a blogger and affiliate marketer to get you started on the right foot. The subject you write about is usually referred to as a niche in the online marketing world, is ideally a narrow topic that targets a specific and well defined segment of the population. And your aim is to be a big fish in a small pond instead of being a small fish in a big pond. That said, a lot of us who start out with affiliate marketing would encounter this huge hurdle: we don’t have any hobbies, not one we’re an expert, at anyways. What is that one topic I want to commit to foor months and years to come? As long as you love that subject, there is no shortage of resources that you can tap into to increase your knowledge. There isn’t much you can’t find on the internet, after all! And the best part is, you can have as much fun learning as your readers. Teaching any subject has a funny way of educating the teacher at least as much as the student. You don’t need to give advice, nor do you have to pretend to be an expert. Write for people one step below you. Over and over, we learn and relearn the crucial importance of having mentors. It wasn’t until I seek and learn from the best mentors I can find, that things really take off. In order to learn anything, you’ll need throughout training and mentors, even better if there is a supportive community keep you accountable. So don’t be afraid to invest on your dream. You’ll succeed much faster and you won’t have to weep as much along the way. That said, it’s not easy to find good mentors on the subject of making money online in this pool of “scams”. The only affiliate marketing training program I recommend is Wealthy Affiliate, an all-in-one training and community for aspiring affiliate marketers founded by Kyle Loudoun and Carson Lim, two amazing guys that you can contact anytime as a member. This is the platform that helped build my online business from scratch They have detailed courses designed for absolute beginners to start their own affiliate marketing business. If you’ve ever tried to find any kind of product reviews on Google, you’ll probably stumble upon dozens of results like this. In short, a bunch of biased reviews on how this product is a scam?! Don’t buy it before you read this! Click on this link, this is a 99,99% legit product! It wouldn’t take 1 second for you to realize that these folks are just trying you get you to buy whatever product they are affiliated to. They forgot that most products online have an affiliate program and there is no need at all to “hard sell” any one of them. But well, it takes a lot of time to research the best products. They don’t care about you, or what you want. A lot of marketers forgot what affiliate marketing really is. Approach the business side of things and the “earn money” side of things the same way you would want to be treated. You don’t like to be sold to by a car salesmen, nor do people that come to your website. Here’s a real-life example of a great review from 10Beasts. Luqman and his team has written a super detailed top 10 best wireless routers with pros and cons, graphics, and tables. Search engines is easily the most effective organic, and free method to targeted traffic there is. If you rank on the top 5 results, you are bound to profit. This is called Search Engine Optimization, or SEO. And keyword research is at the core of SEO, master it and you are on your way to making money online. 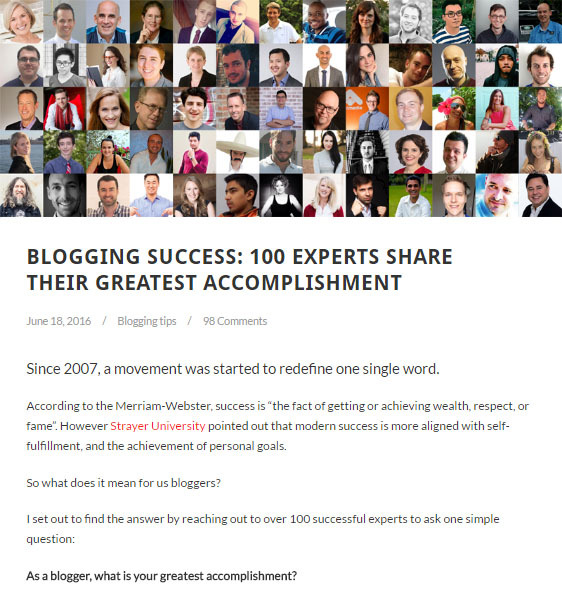 In 2015, I publsihed a post called “108 Experts Give Advice to New Bloggers” that went viral. That single post has generated me over 690 shares to date. It was also linked to from authoritative sites like ProBlogger, and Time Management Chef. So did I rank first page on Google? The reason is I didn’t bother targeting any keywords at first. 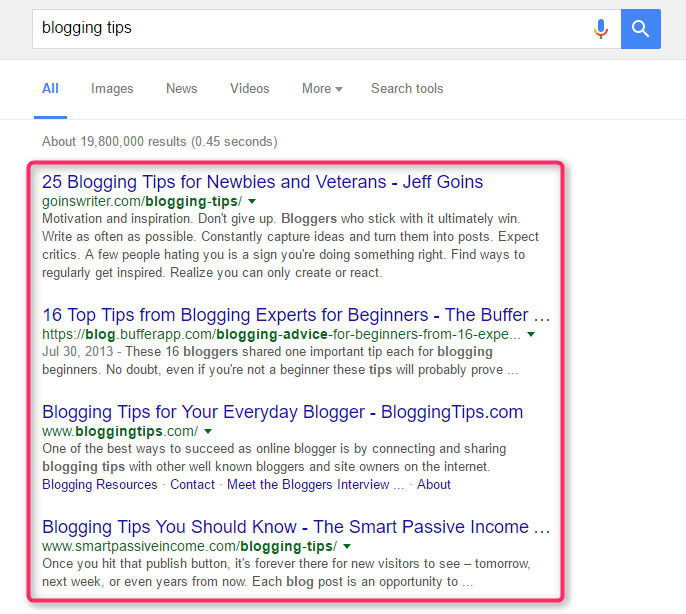 And the second mistake was to optimize for “blogging tips”, which is a far too competitive keyword with top results from industry leaders like Jeff Goins, Buffer and Smart Passive Income. If you learn just one thing out of this post, don’t be me. 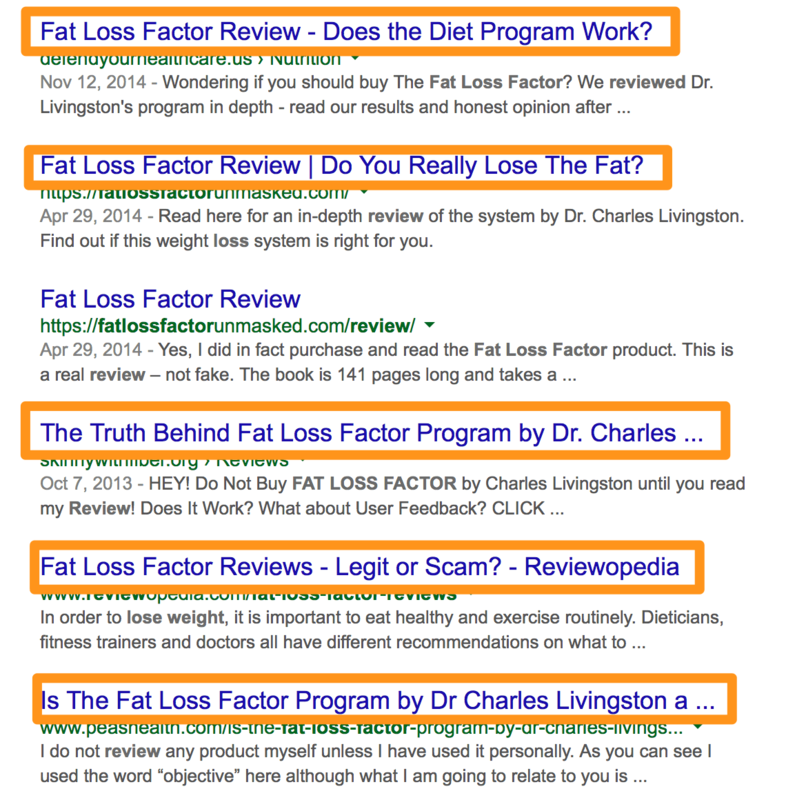 Do your keyword research correctly and your future self will thank you a ton. And it goes without saying that you will need a good keyword research tool. For starters, my most recommended keyword research tool is Jaaxy. It’s an unique keyword research tool that helps you find an unlimited amount of profitable keywords in record time. Of course, that is if you know how to spot low-competitive keywords, here’s a practicle guide for that. Other than that, there is another lightweight SEO tool that I cannot live without is MozBar, a freemium Firefox and Chrome extension that shows you sharing and SEO ranking metrics of every site and pages you visit. Now that we know the best way to promote an affiliate offer is by giving honest reviews via your blog. Here’s the thing, there are many ways to go about reviews. Below we’re going through all the different forms of reviews we write. 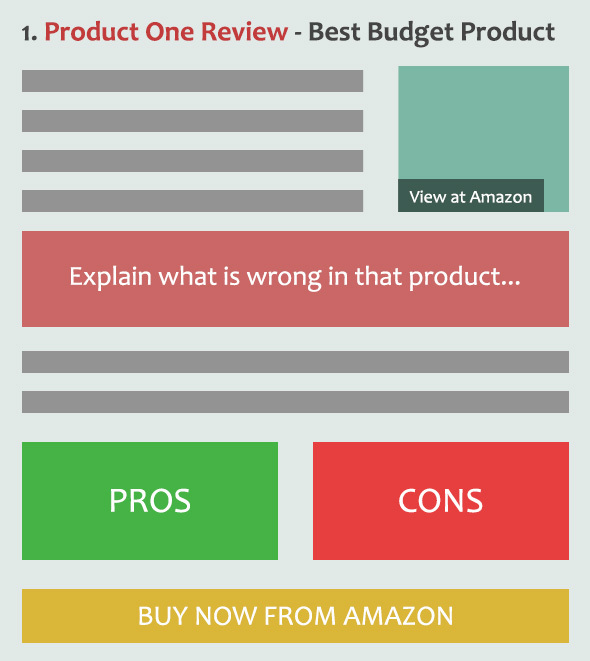 Product reviews are great ways to generate sales by simply giving your opinion about any kind of product, giving it’s pros and cons etc. Personally, I only review products I’ve used and liked. Don’t be afraid to say everything that’s on your mind, your readers would really appreciate your honest opinions. Another thing that I notice a lot of reviews miss is including a how to section to share with your readers the best ways to use that product. Your readers will thank you a ton. Additionally, your take and experience with the product. Here’s an example of a review I wrote, Wealthy Affiliate review. This is an evergreen type of post that you can write right now and profit from in the long run. As human beings, we’re always looking for better tools, products and services to optimize our time and effort. By putting together a page of all your personal go-to tools and resources, you’re not only creating something that’s shareable but also making life easier for your readers. My resource page is Blogging resources that you can check out here. These are similar to review posts. But instead of doing a review of 1 product, you’ll do several. It can be a vs type of post or a top 10, top 15 post. A vs post works well when there are either two products that are very similar and people are thinking about one or the other. 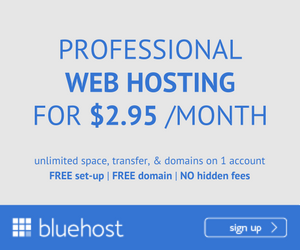 Here’s an example of a vs post where I compare two affordable web hosting platform, BlueHost and iPage. Another type of comparison post that works well is when there are a ton of options, and people don’t know what to choose and that’s where the top 10 posts comes in. 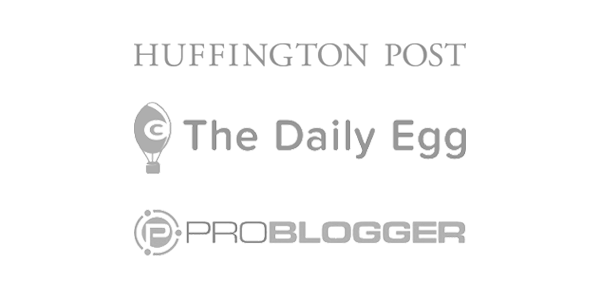 Here’s an example of a top 10 type of post: Top 10 Blog Hosting Sites For New Bloggers. For example, awhile back I created a post that was all about how to create an effective sales page. I talked about format, headlines, psychology – the works. But whenever I create a sales page I use Optimize Press. So this tutorial talked about how it’s one of the easiest ways to create a sales page on WordPress. I like to combine reviews and tutorials in posts like this one, Jaaxy Review & Long-Tail Keyword Research Guide. Here are the best tools and resources I’ve used to build up my online business that you may want to check out as you create your own. I’ve also included some comments and personal notes alongside each products for easier reference. My wild, wild guess is that it will take way longer than you’d expect to earn your first sale. When I first started, I thought I’ll make… 10k in 3 months. Obviously that didn’t happen. If you have any questions about affiliate marketing, feel free to drop a comment. I’ll try my best to answer! Tip 5. Get targeted traffic via search engines. Oh, that’s a very cool article, thank you so much! I’m just in process of creating my own blog and of course it’ll take time but I’m thinking about different ways of marketing for it. And yeah, I don’t want to simply post adds in it, I don’t think that it’s effective in such way, besides such advertisement usually just annoys people, not make them to buy certain products etc. I liked the most of all in your article ideas about different reviews and writing about that things which I really like, I saw such examples in case of other bloggers and they’re really cool and work. When I read such posts I understood that it’s advertisement but it wasn’t so annoying as in case of the usual one. I’ll definitely try these ideas in my blog too! I’m really appreciate thanks for your sharing! Hi! You blogger is such a superb tips for affiliate marketing. I love this you opinion, it is a very good tips for the beginner and those person who want to change their life. I personally apply it on my self and defiantly share my experience with you. We followed your instructions on our project. Thanks! Your website is very helpful. I enjoy the valuable data you deliver to your posts. I am new and just started affiliate blog. I found these 5tips very helpful. Appreciate for the sharing. I am new to affiliate marketing but here I see lots of learning if someone wants to succeed in the Affiliate Marketing. I recently start a affiliate blog and I am new in blogging. Everything is going good but I am still thinking about visitor. Hey, Hey, why did you keep your comment column in the reverse mode? Is there any reason to this? Would like to know it! If it has got any good result I would like to change mine too! But in my opinion it is better to have the other way round! That said, of course it has its’ setbacks on the first commenters as you’ve mentioned! I totally think that affiliate marketing is better than placing tons of ads on a website or blog. The main problem with affiliate marketing is right method to sell a product. Most people gets confused which product should be affiliate on their blog and that confusion doesn’t help them make money. I am now trying affiliate marketing to make some money and also to make sure they don’t just lose that money, they get great service in return from the product service provider. Yes, Ron. My rule of thumb is always to recommend products that I believe in and trust. If you build a business upon “manipulation”, it’s not gonna last long and more than that, it’s not going to make you happy. Which is the most important thing. Thanks for sharing and I wish you all the best in your endeavours! I just start building a blog. Really appreciate for sharing these tips which I’ve been looking for. It’s my pleasure, May. 🙂 And of course, feel free to let me know if you have any questions moving forward. I’m always here to help! I literally enjoyed your post. See, this happens when you never forget the blog or blogger who does some amazing work. When it comes to affiliate marketing, I personally feel that the more I read about it, the better. It’s incredibly simple yet technical. The problem is we start to expect results when we want to see them and this means our focus shifts towards gaining the benefit (making money, in other words)… What I have observed is that once you forget about the money and put your effort, sweat, and energy into DELIVERY OF VALUE, it will help you stage a platform that would brew connections, relations, and networking which could ultimately take you to the larger audience that would certainly pop sales and profits. You said it so well, Hassaan! I agree that online marketing in general is a game of patience. And yes, it’s much better to focus on your audience. Even though you are not creating a product, the same selling rules still apply: people invest in the things that gives them value. 😉 Thanks a bunch for sharing! I fully agree with you in this aspect. And I have noticed noticed that before entering into it we need to have a good base on online, otherwise people will not buy through our sites, This is well go with the Pro bloggers who established a base of their own. I tried this AM but failed, may be because there was no proper guidance or calculations as Anh do, and am sure he will be a good guide in this. Have a great day to both of you. Hey Phil! Thanks for sharing your experience. I hope some of my tips can help you with improving your affiliate marketing campaigns. 🙂 All the best! Thanks Anh, for the feedback I am sure your tips elsewhere on these pages will help me in this aspect. Excellent point., It is so easy to stick adverts all over your site and make it look ghastly, or you can do what many bloggers do and just monetize via affiliate marketing. I try and do a bit of both, but as I grow I also hope to get away from blatant ads on my site. Congrats on an excellent blog Anh. Did you learn everything you know through Wealthy Affiliate, or did you do other courses as well. Hey there, Michel. It’s great to experiment around and find the best monetization methods for you. I learnt a lot of from WA and the community, but it’s not the only place I go to. I read a lot of blogs (here are some of my favourites) and books everyday. Thank you for your very informative and detailed post. I really enjoyed reading this and it is good to see that at least some people are not trying to sell the get rich in a month scam. Wealthy Affiliate is an extremely useful education tool that also immerses you into a community of other like-minded souls going through the same things as you making it even more enriching. Congratulations on your hard work. Aww, thanks Jodes! I’m also relieved. Before WA, I was becoming desperate to finding some make money online training that’s actually genuine. I believe you covered quite a lot here. I like the way how you explain affiliate marketing as helping and not selling. I agree that is the best way to look at it. You’ve recommended some great tools here. I’m going to take a look at MozBar and see what it can do for me. Do you have a review of this plugin? I’d love to read it. And it’s awesome to see that you’re a fan of Fiverr! Currently, that is where I’m getting all of my online revenue. I really like your site, so I’m going to subscribe. Thanks for an interesting and educational read! Aww, thanks so much for the kind words Joeka. I don’t have a review of the MozBar yet unfortunately. It’s a very straightforward and simple tool that shows you the Domain Authority of every pages you visit. I’ll consider writing a post on that. Hello Anh, I hope all is well with you, I feel very honoured that you have chosen me to be a part of your network. I looked at what you said about affiliate marketing and I must say you are very knowledgeable and already I enjoyed reading your post and I will continue to browse your site. I will do my best to provide you with the needed information, let’s continue to network I am glad that we connect, all the best to you and have a good day. Those are fantastic tips, quite a struggle to say which one is the most important. The first tip particularly strikes a home run simply because having a passion for a topic helps us to write with greater enthusiasm allowing for better quality article to be produced and can actually assist in humanising the entire blog. For example people reading this blog can identify easily with your frustrations, successes and of course your enthusiasm for really wanting to help people to create better quality blogs. The human element shines through, which no doubts wins you fans and regular readers. This is a truly wonderful article. You do an excellent job of 1, breaking down exactly what affiliate marketing is 2, simplifying it in easy to understand terms and 3, making it seem possible for just about anyone. I think that’s what scares a lot of people away from affiliate marketing is the thought that it is impossible to achieve any sort of success. You break down that barrier with this informative and well written article. Thank you. Thanks Robert for the kind words! I try my best to be as informative as possible so it means a lot to me when you say that. You’re practically killing it with your posts man, I really love the way your write! I read all of your posts and there are so many familiar faces there too! Like Jack and Edyls. I definitely agree with you on those super promotional titles like “Don’t read this!” or “99.9% legit product review here!” – they are really annoying and are destroying the review-writing reputation. But its actually a great opportunity for us bloggers because if we write genuine reviews with great content and pictures, its fairly easy to rank up on top since those annoying promos are usually very short, most of them barely reach 500 words. Affiliate Marketing is pretty exciting once you get the hang of it and it really is a great form of Online Busines to pursue your life in. And aww, you always flatter me. It means a lot to me coming from you, I’ve admired you since I was a beginner. I try to provide as much value as I can to the readers and I’m so glad you enjoyed my posts! Thanks for a lovely post, blogging is hard and needs a lot of effort apart from writing new posts, there is backlinking, socializing and who knows what. Then comes the hard part, monetizing your blog.What are the right products, finding the right affiliate program, linking products, sales funnel. All this gets confusing to many bloggers as one is not sure what comes where and without proper training,one is left doing a lot of hard work without producing any income with affiliate products. You have explained things so well and every detail explained that anyone reading your post can only benefit from it. Although many bloggers especially ones getting started will follow the money and not following their passion, soon it gets very hard to continue, blogging on something you don’t know requires a lot of research if you are going to produce quality content. Another mistake bloggers make is not investing in the best learning materials, I feel this is where fail or success is.You encourage your readers to join WA, this (in my opinion) is the best place to learn affiliate marketing the right way and succeed. Thanks l really enjoyed your post and bookmarked your site for the future. The most important thing though, is that you don’t give up midway. Blogging is, like most things worth having in life, not an overnight success and a lot of times you’ve just gotta show up and write on a regular basis even if you didn’t see results yet. During those times, know that as long as you keep moving forward you are bound to succeed. So don’t settle, keep going. Awesome story. It’s very inspiring to see that you didn’t quit . You fought and you fought hard . Keep it up! Nice to read yet another informative post. Affiliate marketing is a vast subject, and a newbie can pick a lot of lessons from this post. I could learn a lot on this subject from this piece of writing. Thank you very much for sharing this. I am bookmarking it for my reference. Aww, it’s such a honour to hear you bookmarked my post for further reading, Phil. I try my best to share whatever I know so I’m glad it comes of use to you. 😀 Cheers! This is a great article on affiliate marketing for bloggers, many blog owners do not like to place ads on their blogs because they think it will make their blogs look cheap. However, I think the concept of affiliate marketing will appeal to many more people. Wealthy Affiliate seems like a great program that will teach someone how to go about doing this the correct way, maybe I should give Wealthy Affiliate a try.